Perhaps you have dreams of running outside in your PJs every morning for a quick fix of fresh blueberries from your very own garden? After all, they are delicious, high in antioxidents and a wonderful addition to your morning oatmeal, right? Well they are all of those things and you can have them in your own backyard – you just need to grow them in acid soil. But if you are like me and only have alkaline soil in your backyard, then the solution is to grow your blueberries in containers. It works great and my kids are now the ones running out in their PJs (or something less appropriate) to grab a handful when the plants are in full swing. After growing blueberries in containers for 15 plus years, I have learned that there are a few tricks to the process because sometimes I had success and sometimes not. Here’s the thing – all the books and blogs will tell you to just plant in an acid soil mix and feed “occasionally”. But I have learned that you have to be a bit more diligent than that. Sure it works for the first season. But after the first year, the acidity in the soil tends to diminish because the containers are watered alot and frankly a lot of the acidity washes out. So I have found that from the second year on, you need to feed lightly but more often. In fact, I feed pretty much every month during the growing season to keep that acidity level up. Now, let me be clear: I am not saying to over fertilize your blueberries! I am saying that instead of one big feeding at the beginning of the season and nothing else, I do a half feeding to start and then give lower doses throughout the growing season to keep the acidity up. It is basically the same amount of fertilizer but given in smaller doses rather than one giant dose at the beginning. Make sense? Also, they do NOT like tons of nitrogen (or you get leaf growth with no fruit). I’m just talking about the organic matter you add to keep the pH level in “their zone”. Don’t over feed with general fertilizer you will have the most lush (non-fruiting) blueberry bush in the neighborhood. Don’t worry, this light monthly feeding is not as difficult or time consuming as it sounds. I am just talking about a small handful of cottenseed meal (or other organic acid food) sprinkled over the top of the soil and watered in. Easy! And you will be rewarded with a great crop! Think of it as paying rent! You pay the plants on the first of every month and they will reward you with lots of yumminess! See below for my full regime. Here my blueberries are growing in a red container blended into my edible landscape. I can move the container as I need to. Pick compact varieites such as TopHat or Sunshine Dwarf. Even if they say you don’t need a pollinator, grow at least 2. You just get more berries that way. Choose a large container – but you can always start smaller and pot up as the plants grow. Always use Organic Fertilizer – you are going to eat the fruit and don’t want chemicals in your food. If you can, mulch the pot in the summer months with acid producing mulch such as pine needles, pine bark or true cypress. The first year, feed every few months (as directed on the package of your brand of organic fertilizer). You can use a commercial organic blend or a light sprinkling of cottonseed meal or feather meal. The second year and all subsquent years, feed lightly but monthly with cottonseed meal, feather meal or an organic blend from your local independent garden center. Im gonna give it a Go ! How bad will the bugs and the birds be? should they be covered? I bought these plants 5yrs ago havent really got any berries from them to speak of! You will need to net them when berries start coming. I bought a Bountiful Blue blueberry bush and planted in large pot for my backyard. It was already baring fruit…very excited. Planted in appropriate fertilizer. I placed it next to my Polynesia hut by back wall… within 2 weeks the leaves were browned to a crisp. I was diligent in watering. Think it was getting to hot by the wall. I have moved it to new location far from wall. It’s getting new berries but I don’t see any new green leaves..just the poor brittle brown ones…any advise or encouragement that these will bounce back? My sister put bird netting over her fig bush the first year. She was horrified as birds became hung in the net – fluttering and crying. She cut it off and told the birds she would share. So, think about it before using the netting. Birds don’t share, that’s the problem. Need to know if the blueberries can be grown in Panama, Central America. The climate all year round is about 78 to 84 degrees F sometimes in the summer up to 90s. Can I get seeds or I need a plant. Yes, I believe you can grow blueberries without a winter. You need to start with plants, not seeds. What do I do with the plant in the winter? I live up north and we get a lot of snow. Do in leave it outside in the pot? You can leave it outside in the pot, but you should put it in an area sheltered from wind (like up against a wall) and wrap the plant in burlap. Or you can place the pot where it is sheltered from snow – like carport or porch. I would also add some mulch to the top of the pot soil. They don’t need much water and will go dormant. But don’t let the soil get completely dry. At that point, the biggest concern is the soil in the pot freezing, expanding and breaking the pot. If it is clay or ceramic, this can be a problem. One thing you can do to prevent this is during planting, line the inside of the pot with bubble wrap before filling with soil. This gives the soil room to expand if it freezes. No one can see the bubble wrap because you bring the soil line over the top of it. But to answer your question, yes the blueberries can take the winter months. They are pretty tough plants. I have a container blueberry that is still in its first year. I live in Chicago and harsh winter is approaching! I’m wondering… can I just bring my blueberry inside for the winter? Also, as far as pruning goes, what do you recommend for the first year? And when should I go about pruning it? We love your garden blog and are pinning this post about blueberries to The Home Depot Garden Club Pinterest board. Thanks for sharing these great tips! I drink lots of hibiscus tea. Lots of used flowers. Will they make good mulch for my sickly blueberries? I live in Nevada. Hot dry weather. Hibiscus flowers can be eaten too..add to your salad beside making tea. Gosh Peggy – I wish I could help here, but I am not experienced in indoor growing of berries or hydroponics. Maybe another reader can chime in on that one. Blueberries have a chilling requirement in order to flower and set fruit. Traditionally, blueberries had a high chill requirement (hours <40 deg), meaning they could only be grown in certain climates. In the past several years, plant breeders have produced plants with very low chilling requirements , which allows them to be grown in places such as Southern California. That said, you need to get SOME chill, so not sure indoors will work unless you crank the AC way up! I was wondering the same thing. Maybe wheeling them out of basement during winter somehow. There are also ways you might be able to cover blueberries and bring to a freeze for needed amount of time. For instance you can bring a freezer to basement and modify door to bring needed cold air to plant plants. Maybe that might help?! I do not know much but have many ideas. (Lol) I am sure there is a way to make it work. I am thinking if you do not need much water during winter you should be fine. I guess you would have to be careful not to freeze roots. I was wondering about air quality in basement. What is air quality like? How has or does it affect hydroponic plants? I am interested in aquaponic planting myself. Air quality is a concern of mine in closed off spaces such as basement. Thx for the tips. I just planted 5 blueberry plants in the ground and look forward to a great harvest using your tips. I live in Georgia where acidic soil is the norm, so, the plants should do fine, however, I need to check the PH level. How long can a blueberry plant live in a container? It can live in a container indefinitely if cared for properly. But many times, they get ignored after 3-4 a few years and they start to decline. This is because they become root bound and need fresh soil and more room in the pot. To keep them healthy in the pot, you may have to pull them out every 3-4 years and give their roots a little trim, loosen the soil and repot with fresh potting soil. I have one blueberry that has been potted for over 10 years – still going strong. I want to try this so badly. I live in a city, we have this little “gate” area that most people use for garbage cans. It is on the north side of the building, but gets morning and late afternoon sun because the street is an East/West running. I put a 3′ x 1’5″ raised bed in it with miniature roses, sun flowers, morning glories, and moo flowers. Last winter killed my roses. I was thinking of replacing the roses with blueberries, or grow on in a large grow bag. Grow Bag: 12-1/2″ in diameter x 11″ H. Holds 20 quarts of planting mix. Would it be too small? How would i trim roots? I fear killing bush. I am a novice at planting at best. The nursery i go to has a pink blueberry variety. Can i train non cantianer blueberries to be container blueberries by trimming roots? This idea of trimming roots facinates me. Hi Theresa. I can`t figure out how deep/big the container should be for blueberries. There is a wide range of different types ofcourse, but to avoid the limits of room in pots, I want to use type of raised bed solutions. What do you suggest? 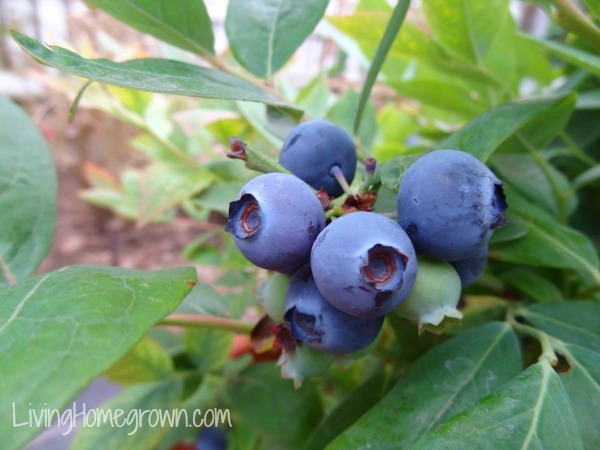 Should potted blueberry bushes be pruned during winter months? If so, how much and how early in the winter season should you prune them back? For when I said only, I meant on my window. I’m in my iPhone at the moment. haven’t ever experienced any bberry interest from dogs or cats in my yard, (its the birds that go nuts on mine) but if concerned, this works in my yard: surround with pig fencing (aka concrete wire mesh, hm depot, <$10 ~4×8' sheet). snip wire @ 1 end so u can bend wires to hook to other end when forming a 'barrel'. slip over plant(er), like a tomato cage or on the ground. u can attach strips of shiny mylar or string old CDs for double duty if the robins r robbin too much (or just plant more to share). How can i plant a blueberry? So I am in year three of some plants. Both pots and in ground. All ot the plants have flowers but very few leaves. The opposite that you mention above. Any thought on how to get good foilage back onto the plant? WHen I pulled a couple of the plants out of the pot. The roots were formed into a circle but not out the edges of the pot. Its this normal? I’m new at growing blueberries and I need help idk how to do it right and I have read a bunch of different things can I get help please. It has info on blueberries and other common fruit. I live in the Central Valley. How well will the blueberries do in our heat, and is there anything special I need to do for them? Do you get berries from the first year? I did get berries the first year on all my plants, yes. What is considered to be first year? That is great! I live in Niagara area and LOVE blueberries…will try to grow some in containers. Thank you for your thorough instructions and encouraging comments! Will have to find the right kind of netting for the berry season though as we have lots of birds in our back yard. Dont expect 2 get ph in normal garden soil down enough the first year, you cant add that much acidifier at once without possibly hurting the plant. If pH needs to be reduced by more than 0.2 unit, begin the acidification process a year before planting. Acidifying using elemental Sulfer relies on microorganisms for conversion to sulfate. This requires warm, moist conditions. (Do in early spring, plant in the fall for minimum timing) [keep potted in azalia potting mix while adjusting the final garden bed soil]. Incorporation of Douglas-fir sawdust or compost, especially to heavier soils prior to planting is a common industry practice, and mulch w/ pine needles if u can. NOTE: Use of cedar, oak, walnut, or other sawdusts AND HORSE BEDDING is associated with chlorosis [leaf yellowing and die-back]. The frequent sprinkling w/ cottonseed meal mentioned works great. most city waters are alkaline, hard water is very much so. “- Allow only plants with sufficient vigor to produce a light crop in the second year [pluck off blossoms yr 1]. Early cropping (fruiting in years 1 and 2) has been shown to reduce root growth and yield in years 3 and 4.
ph meters arent costly, and bberries are pretty easy IF ur careful the first couple years getting them established. For ur other reader, i’ve seen bberries in hydroponic and aquaponic setups thriving, so it can b done, but Im just learning about those now. Thanks for posting additional details. I am very new at growing and can only use pots to grow. I would like to be organic in my growing of my plants. Is lime considered organic? I know that when i worked with concrete it has lime in mixture. Is this the same lime? My other question is mulch. What does that mean? Cottenseed? Pine needles? I was born in south jersey and remember soil being sandy. Plenty of yummy blueberries when i was a youngin. Do i need similar sand in soil? Very interested in aquaponic growth of blueberries. For now learning just basic growth. Would be cool make own organic ferterlizer and mulch. You spoke of saw dust. Is this to replace sand? Some lumber at stores are chemically treated. I think even dugfir might go through a process not certain. Can i go to lumber store and use this saw dust to use as suggested? How fine or coarse does it need to be? Should i be find ith saw dust from cutting tree down cause it has a mixture of coarse and fine? I live in PA. It is still very cold here in the evenings. Should I start my container blueberries in the house and move them outside when it’s warmer or should I just wait to plant them when it warms up and when they could remain outside? Thank you! How close do the pots need to be to each other? I purchased three mature blueberries in clay pots (about 3 yrs old), with fruit on them, and I would like to know how close the pots need to be next to each other. I keep my blueberries within 15 feet of each other. When you say “feed lightly every month” what exactly does that mean? Could you give me a measurement? I know it probably differs depending on the fertilizer but how do I know how much to apply at the beginning of spring and at the monthly fertilizer feedings for 2nd years? Do I need a different fertlizer? Mine are in fabric containers in a mix of peat moss, pearlite and pine bark mulch. So I decided to try and grow blueberries in pots next to the patio (its too narrow to put on the actual patio). One is in a 5 gallon pot and the other looks like maybe twice the size. On the small pot I have a Tifblue plant (very small, no berries yet) and a Brightwell (completely fills the pot, lots of berries). When I planted the little one the lady told me to plant it in just spagnum moss so it’s mostly that with a little potting soil. The bigger one I used an independent stores blueberry mix. It’s been a couple months and I haven’t seen much growth. The berries are still green and the leaves don’t look great. The little ones leaves are bumpy too. I bought a 3 in 1 soil/moisture/ph checker and both are very alkaline. Like 7 or off the dial. I’ve fertilized the little one a month after planting and they both have pine needle mulch. I’ve added coffee grounds and banana and orange peels, I’ve added vinegar to the water for feedings. I’ve even used Soil Sul (the other day) a liquid sulfur concentrate and the soil has not come down. I don’t know what else to do. Please help!! We live in Sugar Land, TX btw. Oh I forgot to mention that I watered them a lot once and they seem to be staying wet. There is just one medium sized drainage hole at the bottom of each pot and I didn’t put any gravel in the bottom. I can send pics of them too if you want. How large of a container is necessary to grow blueberries? I would like to start with a good size so I don’t have to continually replant. Okay, I’m pretty excited about this! I have ordered my Pink Lemonade Blueberries. Next I will order a couple of dwarf blueberry plants. I think that my granddaughter will LOVE picking and eating them! Thank you for the information! I have not tried that, but I would think it would work. I love the idea of growing the blueberries in a pot to keep the soil acidic but was thinking of using the Smartpots and putting the pot into the ground up to about maybe keeping 3 inches above ground. This way I could keep my soil acidic but at same time have a look that its in the ground. I plan on growing other things, flowers, in front of the blueberry bush. The Smartpots are a fabric though. Do you think this would work??? Yes! I think that would work. I am not familiar with Smartpots. But it sounds like even if some of the nutrients leached out, you would still have a semi-controlled environment. I would give it a shot. Wondering if you’ve tried the Smartpots and how they worked for you. I’m looking at doing the same thing myself and had the same questions. When preparing my soil I always mix in 1/4 organic compost. Will this affect my soil acidity? 1. (DiMeo Farms email) Mixture of 50% “course grade” masonry sand, mixed with 50% peat moss and that will give the perfect drainage, pH level, organic mar]tter level and then you can use “Holly Tone” to add acidity. 2. (Waters J9 blueberry Farm) 100% Canadian Peat moss as ideal planting medium. That is what they use. Also-they reccomend Miracle grow Acidic fertilizer (for Azaleas) Plants should be fertilized per their directions which will come with the plants and then once every month thru harvest season, i.e. august. 3. Knollwood Garden center employee: 50% Peat moss, 50% dirt that you dug up (to encourage root growth) and maybe some Epsoma Biotone starter for root growth. Next year add soil acidifier. They all agree on the Peat Moss just not how much. The J9 farm is in Kentucky so maybe they know how to grow in soil close to mine?? Dimeo farms is in New Jersey. Both places know I live in Ohio and generally have acidic soil. The garden center employee is right where I live. Please help in the best way to grow Blueberry bushes. Thank you for sharing your insights, just got a few blueberry bushes and am excited to plant them. What size and depth container do you recommend per bush? I have two dwarf blueberries in a pot. Can I bring them inside the house for the winter? Or is it better to keep them outside. I live in zone 5. I have never grown anything before but I want to start and so I am looking to start growing blueberries in one of those over the railing rectangular containers. Is this possible? Should I get seeds or a plant? Is it too late in the season? (I live in Memphis, TN.) and also, do you have any suggestions to help guide me on my first time growing? Thank you so much in advance! Hello. I bought two blueberry plants, but the type is unknown. Could I still grow them in a container? Thank you! I read that you should have 2 plants about 15 feet apart. It that necessary for pollinization? If they are grown in a screen room how can pollination be done? Thanks for any advise you can give me. Hello thank you for your information!! Question, we are moving to Oahu Hawaii can this be done there with the climate they have? We will be living on the windward side, rainy side or east side, of the island. Would watered down whey (left over from yoghurt making) be a suitable fertiliser? I know it acidified the soil but don’t know if it feeds the plant. how big of a pot? how many gallons? Is it better to have a wider pot or a deep pot? How deep do roots go.? Hello! My husband just bought me a little blueberry tree, it’s about 6 in tall. I need to grow it in a container, but was wondering what size pot to put it in. I’d rather start larger because I know transplanting can be risky. Thanks! Hi, I want to grow some blueberries indoors in a sunroom. The chill requirement can be met in that environment, but it might be bad for the other plants in there. What are the varieties that can be grown in a warmer environment? I live in New York and the winters get cold. Will I be able to grow my blueberries in a pot outside. Started my blueberries (2 northern varieties) last year in containers and kept them on our deck. Gets cold here (Nebraska) so I moved them to a screened, partially underground porch for the winter. They are leafing out and blooming. When should I put them back on the deck? My wife and I just purchased a home and five acres, in an effort to be a little more self sufficient we are starting a small orchard (the cost of fresh fruit is just absurd), I would also like to plant about five blueberry bushes around the edge of the orchard, I believe I am going to put these in large pots rather than in the ground as it is just a bit too wet I believe for them, pots give me a little more leeway, I am unfamiliar with the types/hardiness/taste, we are looking for a sweet flavor, preferrebly jun-aug harvest. we live in Muskogee Ok. any suggestions ? I read your post on growing blueberries, can you can those or is it best to just freeze them ? My blueberry plant is dropping leave. Its April here in Sydney and plant is in small 9 inch dia pot. Have been feeding with Dynamic lifter, alternating with worm tea. Balcony facing NW Sydney. ????? Hi- I lived reading all the comments above. We purchased our first blueberry plant today (as well as some tomatoe and cucumber starter plants). My kids are very excited to grow some fruits and veggies on our porch. I was told you must have more than one blueberry plant in order for it to polinate and grow. Is that true? This is our first time growing plants and all the terms mentioned previously were a little over our heads :-). Thanks for your help! Alright, I’m giving this a go! I don’t have the greenest of thumbs but I’m getting better. Thank you for the tips! Hi! Love the post! I am curious though, how did you winter your blueberries in the containers ? Did they have any special requirements? A local nursery owner told me that coffee grounds add good acid to soil. He told me to use just use a handful. Good luck, everybody! I have read the article and all the comments. I have been unable to find any information on how often the blueberry bushes planted in containers need to be watered. Can you help me with this? I have had my plant for a couple of weeks, it started out great and now I have noticed some of the leaves turning brown. 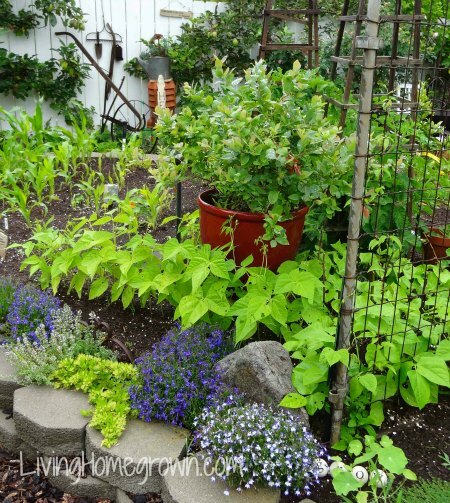 How often you water depends upon your climate, the type of soil in the pot and the type of container (porous or not). It varies completely based on the different combinations of those conditions. So to determine if you need to water, you need to assess your particular soil in your particular pot. Do do this, stick your finger into the soil (down a few inches). If it is dry, give the pot some water. If it is moist, wait a few days. There really is no set number of days to water because the soil of a pot in one area will dry out in a different way than a pot in another area. So just check your container and water before it gets too dry. Is it possible to overwater? the leaves are turning brown. Yes – it is possible to over water. Be sure the blueberries are draining. Only water when the soil feels dry when you stick your finger into the soil. You mentioned large container. I have a faux half barrel that is 22″ in diameter but is 15″ inches tall. Is that ok or is it not deep enough? No one has been able to provide me an answer. Thanks. Forgot to ask this in my previous comment/question. Do I really need another blueberry plant for pollination or can I hand pollinate? The plant I purchased is called Misty blueberry, if that helps. Thank you. Thank you so much for your sharing knowledges. I need your help. I have small blueberry plant with ph soil is 6 (i already use vinegar dilute with water for watering). So, in my mind, the plant needs more acid and i wanna use a bit of amoni sulfat to lower ph to 5. I’m too confuse how much it should be (1 tea spoon?). My container only 10 liters of soil. 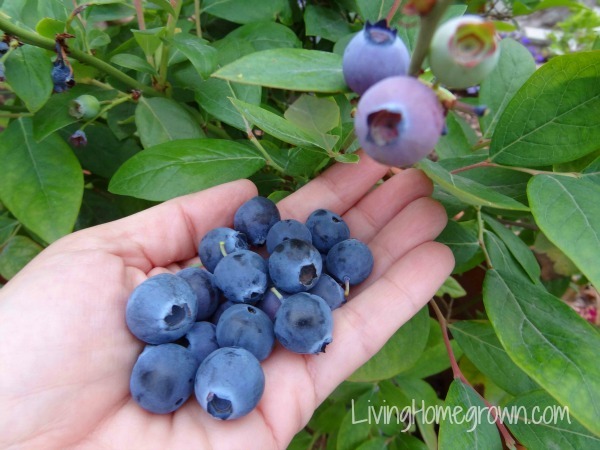 Can you grow more than one blue berry bushes in one 22 inch container? For example, can one grow Misty and South Moon blue berry in one container? Hi, We want to plant 20 – 25 blueberry-plants, each in a container(80 liter) and want to dig them in the ground for 80%. How does frost effect the plants? We have minus 20 degrees Celsius (-4 Fahrenheit) in the wintertime. Or can we just put the containers above the ground? Thanks for a answer. I live in PA and want to grow blueberries in a container. Do I need to take these inside during the winter? I planted 5 TopHat blueberries in separate containers a year ago, in the spring. I kept them indoors over the winter. I got quite a few blooms, but the blooms came before I could set them outside, so there was no pollination. Please, is keeping them indoors appropriate, or do I need to leave the containers outdoors? We are in the country and have numerous deer and rabbits that always ate the blueberries that were planted in the ground. The deer even managed to tear down the fencing I had around them! I have to keep the potted ones on a table to keep the rabbits away from them. How do I store them over winter so that I can get blooms, then blueberries? I have already established blueberry plants in a too shaded area so I want to transplant them into pots. Now that it’s nearly fall in our area should I do it now or wait till next spring? Will the Legacy variety grow well in a pot? If I plant blueberries in a container of 20 gallons, once filled with soil, won’t that be too heavy to move around? What is an ideal container size for a blueberry plant? Thank you Theresa for a detailed and most useful article. Leave a Reply to Gloria Alkins Click here to cancel reply.